Say hello to SUPER 10, with all the boxes priced at $10! I’ve just received some inside news to what Black Box is up to recently. Apparently, they really have something up their sleeves. Some of you might have already noticed the little changes done to the bi-monthly boxes, so let’s wait and see. For now, let me introduce something that’s more exciting for all of us today – Say hello to SUPER 10! The Black Box team just put together 3 LIMITED EDITION boxes for the month of October, and what’s unique about these boxes are that they have a different superhero character that represents the personality of each box (I, for one could relate to one of the boxes). So which tickles your fancy? Let’s take a look at my SUPER 10 box, I’ve received Sapphire Wonder! I’m so glad that Blackbox chose this particular Super10 box for me.. it’s so me right?! Well, at least I like to believe I am working towards this direction (: Without further ado, let’s get down to reviewing the contents! If you have been following BlackBox on their youtube channel, you would have seen my previous review on Klarity Lasertox Miracle CC White Lotion a few months back. A 11-in-1 multi functional lotion, this miracle product leaves my skin at least one tone lighter instaneously! I like how it is light on the skin and protects my skin with SPF30/PA++ sunscreen, hydration and anti-aging properties. And yes, I still stand firm on my recommendation of how this product is good for busy ladies and even better for the lazy ones! 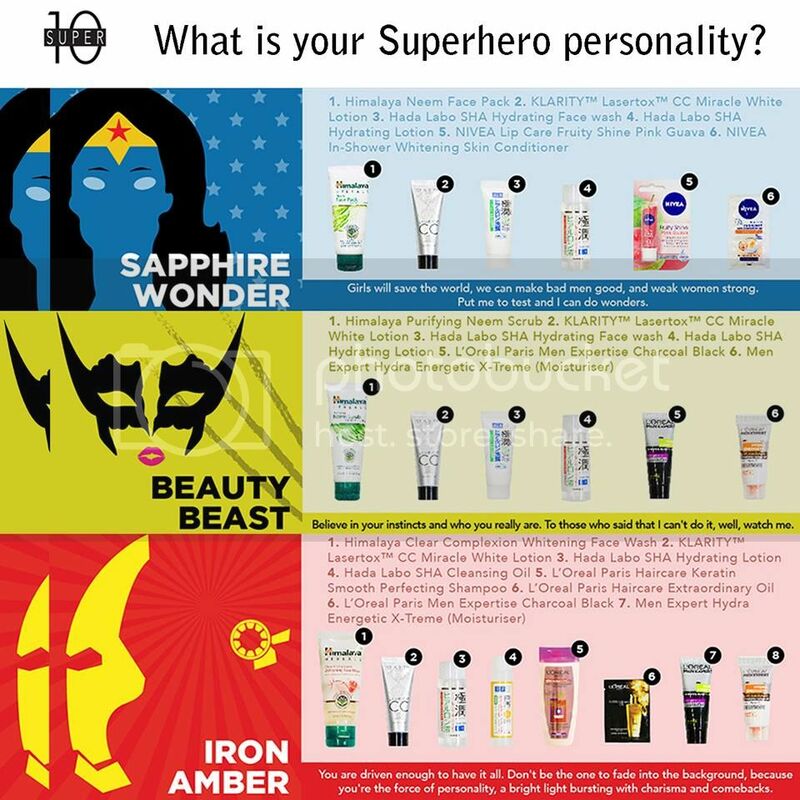 Next up in my Wonder Sapphire beauty box are Hada Labo products.. doink doink! Famous for its hydrating skincare products, Hada Labo SHA Hydrating Face Wash and Hydrating Lotion in travel size is perfect for my upcoming winter trip! 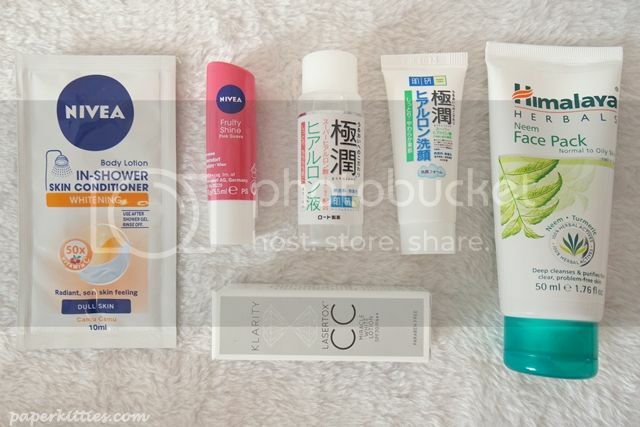 Due to my oily skin, I have always prefer products that are very watery and light just like Hada Labo products! The Hada Labo SHA Hydrating Face Wash is very gentle on my skin without ripping it off its natural oil whereas the Hada Labo SHA Hydrating Lotion absorbs quickly into my skin, leaving it supple and well-hydrated with dewy radiance. 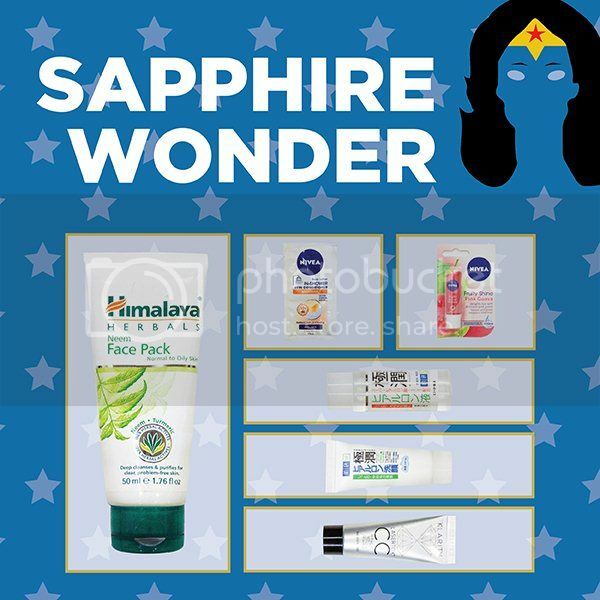 Still on skincare products, we have the Himalaya Neem Face Pack that aims to help regulate excess oil secretion, cleans clogged pores and prevent recurring pimples. This mask smells pretty herbal-ish (kind of reminds me of henna) due to the goodness of Neem, Fuller’s Earth and Tumeric. Whilst spreading the mask on my face, I was amazed to find out that it contains exfoliating beads too! It also has a slight cooling sensation which I enjoyed for 10-15 minutes before washing it off. It’s awesome for acne-prone and oily skins without irritating or cause dryness. It’s pretty pointless having good skin when your lips are dry and cracked, so thank goodness for Nivea Lip Care Fruity Shine in Pink Guava – that happens to be my favourite fruit loaded with Vitamin C. What a yummy and unique flavor! It smells awesome and glides on really smoothly on my lips, leaving a touch of light pink shimmer tint. This has got to be my favourite product in this beauty box! 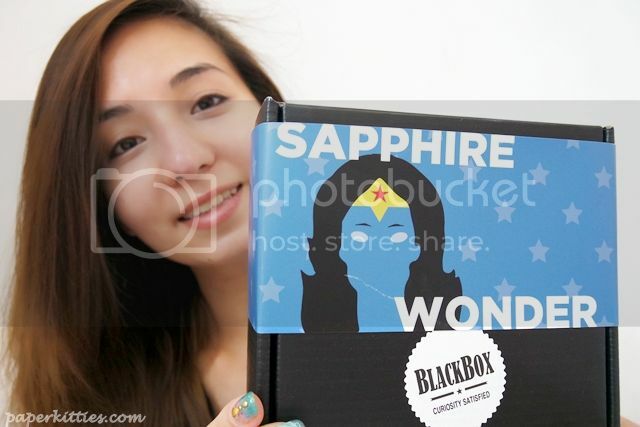 SUPER 10 Sapphire Wonder box, together with 2 other variants, Beauty Beast and Iron Amber, are available at Black Box Qoo10 store or E-Store at $10 each. Can’t decide on which to buy? Why not get all 3, at a special price of $25! Interested in getting to know more about the BLACKBOX Community?